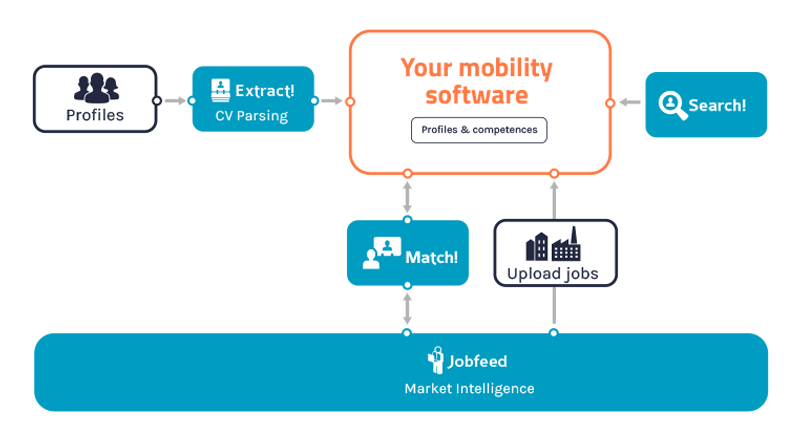 Speed up the outplacement process with Textkernel’s labour market intelligence tool, Jobfeed, and its semantic search and match technology. Rapidly determine your clients’ employment or redeployment potential and find them an appropriate job faster. Integrate Textkernel’s CV parsing technology into your system to offer your clients an easy, mobile-friendly, one-click procedure to create a profile. The CV parser automatically extracts CV data and turns it into a searchable candidate profile in your system. Jobfeed is a searchable and analysable database of real time and historical job data published online. Create search profiles for your clients and have Jobfeed monitor the vacancy market. Get insight into your clients’ (re)employment potential and let Jobfeed accelerate the mobility process. Textkernel’s user-friendly semantic technology will help your clients and consultants to find the right jobs. By understanding what they are searching for, rather than just looking for what they type, Search! will offer more job opportunities and higher relevance. Directly integrated with Jobfeed, Match! allows you to instantly evaluate the relevance of jobs against your clients’ profiles. More jobs and relevant results will significantly speed up the redeployment process.